I mentioned here that I’m trying to avoid the oven during these hot summer days. Later this week, I’ll be making Lasagna Casserole, which is one of our family’s favorite recipes (and one of mine because it’s so easy). But, I don’t want to bake it in the oven right now. It’s just too hot. For recipes like this, I “bake” them on the stove top. Just follow the recipe as normal, but then leave it in the pot on the stove. Sprinkle cheese over the top and put the lid on. Let it sit and simmer for a few minutes until the cheese is all melty all over the place, then serve. This method also works for Cheesy Beef and Rice and Pizza Casserole – and probably a bunch of other casserole recipes you have that are all pre-cooked and then baked for a few minutes. This summer, skip the oven. Use the stovetop. Unless of course you like sweating profusely and passing out. I’ll use my oven when I absolutely have to. In the meantime, when I can, I’ll stick to my stove-top. This post was originally published on June 29, 2009. This weekend, I “baked” a frozen casserole on the grill. It was wrapped in heavy-duty foil, so I peeled back the top, and put it in a “pan” made of another layer of HD foil, then rolled the edges down together to hold it. I lit one side, turned it down to low/medium low, and put the casserole on the other side. Then I LEFT for an hour and a half. When we got home (about 2 hours on the grill total), the edges were hot but the middle wasn’t quite hot yet. Close enough for our little family! I also took some hamburger buns that were at the end of their prime, combined some softened butter, shredded mozzarella, and garlic bread sprinkle, spread that on the cut side of the buns, and put those over direct heat (still on low flame). By the time the cheese melted, the bottoms were a bit crispy. Perfect! And cool kitchen! Hi Laura! I continue to enjoy your fabulous website!! Coming from Texas, I understand not wanting to turn on your oven! I do my cooking early in the day (like 7:30 in the morning! ), then reheat later so the house stays cool and we can still enjoy our oven-cooked favorites! Thanks so much for the ministry you provide to all us stay-at-home mamas! Hi there! I found my way to your blog from Shine Like Stars. 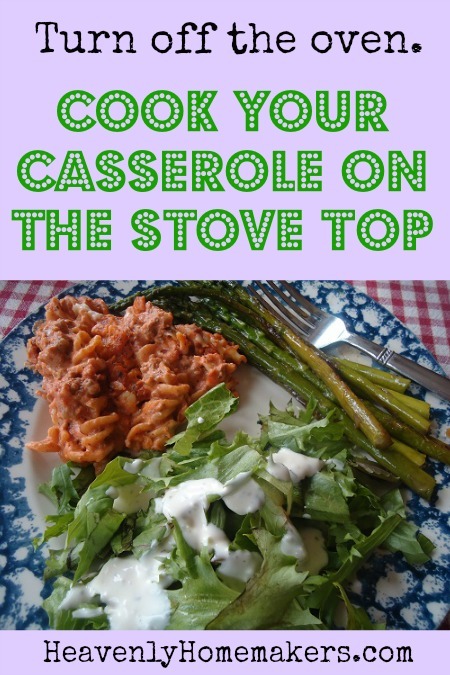 I really like this post about making casseroles using the stove top. Great idea! Yes! We do this when it’s too hot, I’m anxious about how much energy the oven uses, or I’m … feeling lazy. Haha. In fact, quite often I sprinkle the cheese in, cover, and turn off the stove. The residual heat finishes the job, and the cheese gets all ooey gooey instead of crispy at the edges (which I don’t care for, but some people love). Don’t forget how simple a solar oven can be. A couple of cardboard boxes nested, something reflective, cast iron with a lid. Make use of the sun and the crazy heat! Or at least make sun tea- herbal, of course. This sounds so yummy! I love your blog! I check in everyday! Thank You! Ah, I don’t mind cooking stuff in the oven, a/c is a wonderful thing. And it’s not all day. yummy, that sounds good. I have to true it soon. I did try the starwberry bread, the roomies like it. great reminder-tried it last night on the stovetop and it was a hit! thanks! Hey! I have been experiementing with using cast iron on the BBQ. Saturday I made fajitas. They tasted like they came from a restaurant and our house stayed cool. So yummy! This reminds me of the apartment we lived in in Moscow that NEVER had a working oven. We had TWO refrigerators though, crazy. So, when we wanted lasagna, we made up the dish and carried it down the street to the tram which ran on its tracks close to our teammates house and we baked it there. Reheating the lasagna (without a microwave) was tricky. That I did on the stove top in a skillet with a lid very slowly. It was delicious. I make my Lasagna in the Crockpot most days now. I wish I had a covered porch and then I would set it outside to cook. I am trying not to cook in the kitchen as much this summer, but our grill has taken a few beatings in some high winds and is out of commission for a while, until I fix it. So I am using my Dutch oven and cooking over coals and fire. It is like camping every day and it is easy and fun at the same time. Thanks for your stovetop cooking tips. I used 1 tbsp. of both dry spices and we thought that was too much. Was it dry or fresh? YES! You can bake just about anything on the stove with the right pan. Thank you Laura for sharing this energy savings tip! If you want to do some serious baking, I’ve found that for best results, your pan should be a good stainless or cast iron pan with comparable lid. Heat it up till the lid is too hot to touch, then turn it down to the lowest setting. (Meat is better when browned first.) Keep it covered and let it bake slowly till done. Some dishes require venting so moisture does not build up inside the pan. The cooking time will depend on what you are cooking and the pan you are using. If you want to brown the top of the dish, you can try using a torch just before serving, the same way you would brown crème brulee. We lived without central air for years so I’ve baked cakes, potatoes, meatloaf, roasts… just about anything on top of the stove. I have a good oil filled stainless electric skillet that works well for this too. Do not try it with thin walled pans on the stove top. They will burn the food on the bottom before they finish baking. I know ya’ll aren’t big on the microwave and I really don’t like it for heating up leftovers (they always get tough or soggy), but I have found one thing I like it for. In the summer when I dont’ want to heat the oven up for a long time, for say, to a cook a casserole. I use the microwave for about 5-10 minutes to get it started and then I can I can usually cut the oven time in half. This works especially well if you’ve made the casserole the day before and put it in the fridge, it just takes the chill off it, so you don’t have to cook it so long. I’ve been experimenting with cooking casseroles in the crock-pot. I’ve found that most that have all precooked ingrediants can go in the crockpot on high for 2 hrs and be done. I’ve even done meatloaf this way. Unfortunately I work outside the home, so it means I have to remember to call my husband (who works from home) and have him put the casserole on. I don’t like things cooked in the crockpot for the 8-10hr time, to me they get overdone and meally. We have toaster oven that we do use a lot, but it’s not big enough for a full size casserole. The next time I buy one, I’m thinking about a convection one. My mother-in-law solved the “not heating up the kitchen dilemma” by installing an oven in her garage (she got it for free from a family who were remodeling their kitchen). It works great and it also gives her extra oven space during the holidays.